230 x 140 mm (9 x 6 inches) - xvi, 1518pp. Brown hardback half-leather cover with marbled boards. G : in Good condition. Cover rubbed and scuffed. Occasional pencil marking. Ex Royal College of Surgeons Ireland Library. 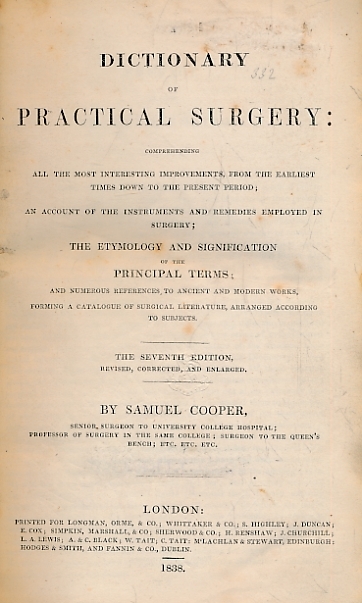 '...the entymology and signification of the principal terms; and numerous references to ancient and modern works, forming a catalogue of surgical literature, arranged according to subjects'.